Local guitarist & performer Pernell Riechert takes the stage for a night of singing and strumming. For more info and where you can find Pernell’s next show, check out his website here. 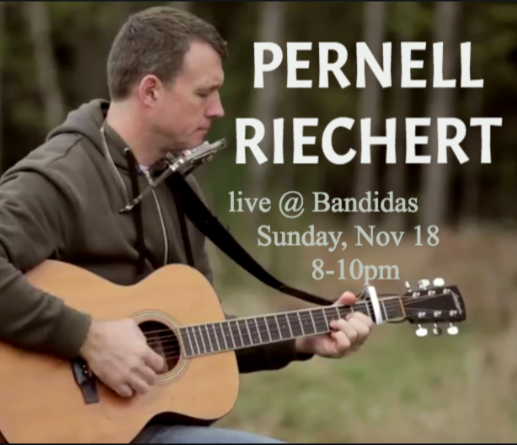 "Pernell Reichertis a singer/songwriter/guitarist from Vancouver, BC. He fine tuned his entertaining and playing skills after years or hoboing, treeplanting and oil rigging. Pernell has played many pubs, clubs, cafes and festivals around Western Canada, England and even South Africa. His solo show is a mix of roots, americana, fast finger-picking folk and alt-country, playing a mix of originals and covers. He has three CDs, recorded with his band, the Pernell Reichert Band."